This nitrate product is a soil-stable form of nitrogen(N) that is immediately available for plant use. It can be spread dry or dissolved in water and applied through irrigation system. For dry applications we usually recommend broadcasting the product and then running the furrows (cultivating) to throw the pellets up into the bed or main rooting area. This puts the Nitrate where it will be used mainly by the crop instead of the weeds. As opposed to banding, it also disperses it through the soil, avoiding the downside of placing a salty solution in close proximity to the plant roots. Allganic 15-0-2 can also be liquified for application through irrigation systems, banding, or spraying. Although it is possible to dissolve 3+/- lbs of 15-0-2 in 1 gallon of water, it is difficult and requires heated water and time. Water with naturally high Total Dissolved Solids (TDS) will also be more resistant to the addition of 15-0-2 (or any other fertilizer). We have found that under typical field conditions one pound of 15-0-2 per gallon of water is a reasonable goal. This will be easier and take less mixing if your water temp is above 70 degrees F.
Summing up, Nitrates are not as volatile as other forms of N, but can be more easily leached. 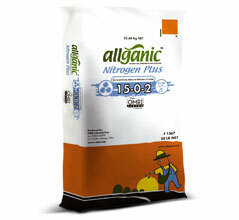 Allganic 15-0-2 can be used to closely match N supply with times of peak N need by plant. In Organic/Biological farming, 15-0-2 is especially needed in the cooler months of the growing season when the microbial release of organic N from the soil slows.